Akram Abbas al Kabi, the Secretary General of the Harakat Nujaba, holds hands with Hassan Nasrallah, the leader of Hezbollah. Image from the League of the Righteous’s website. An influential Iranian-backed Iraqi militia said that it and Hezbollah “are the twins of resistance that cannot ever be loosened or separated.” The militia, known as Harakat al Nujaba, or Movement of the Noble, made the statement after the Gulf Cooperation Council and the Arab League branded Hezbollah a terrorist organization. Hashem al Musawi, the official spokesman for Harakat al Nujaba, issued a statement on the group’s official website on March 13 that defended Hezbollah from the terrorist designation by both the Gulf Cooperation Council and the Arab League earlier this month. Musawi also indicated that Hezbollah actively fought inside Iraq and took casualties there, presumably during the US occupation as well as during the current fighting against the Islamic State. “The blood of Hezbollah which flowed in the land of Iraq is our responsibility for so long as we exist,” Musawi said at the opening of his statement, which was translated by The Long War Journal. Musawi then accused the Gulf countries or cowardice and said the Popular Mobilization Front, the Iraqi government-sanctioned organization that is dominated by Iranian-backed militias, including Harakat al Nujaba, must teach them “the meaning of bravery and sacrifice.” He also accused the Gulf nations of being American puppets. Harakat al Nujaba has close ties with Lebanese Hezbollah. The two groups have coordinated activities as Iraqi militia fighters entered Syria to battle rebels and jihadists. The militia was established to funnel fighters from two other Iranian-backed militias, Hezbollah Brigades and Asaib Ahl al Haq, into Syria. It has been spotted on several battlefields in Syria, including in Aleppo. Harakat al Nujaba is led by Akram Abbas al Kabi, who previously served as a senior commander in both the Mahdi Army and Asaib Ahl al Haq. Kabi was listed by the US as a global terrorist in September 2008 for aiding the Iraqi insurgency. He was listed along with Abdul Reza Shahlai, a deputy commander in Iran’s Qods Force. Kabi has close ties with Iran. Last year, Kabi was photographed with Qods Force leader Qassem Soleimani during a battlefield tour in Aleppo, Syria. Photographs of the two commanders were published on Harakat Nujaba’s website. Harakat al Nujaba also touts its relationship with Hezbollah. 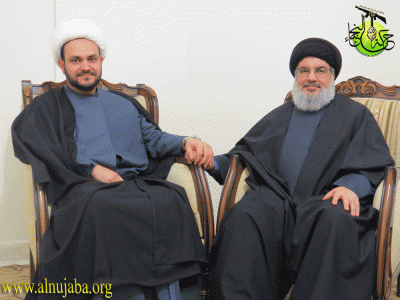 On its website, the group published a picture of Kabi holding hands with Hassan Nasrallah, the leader of Hezbollah. The two met in 2015 to discuss the security situation in Iraq. Cooperation between the two groups and their leaders goes back more than a decade, when Iran’s Qods Force directed Hezbollah to aide in the establishment and training of what US military commanders used to call the “Special Groups.” Qods Force leader Qassem Soleimani, who is frequently seen on Syria and Iraq’s battlefields coordinating with Shiite militias against the Islamic State, and commanders such as Abdul Reza Shahlai were instrumental in establishing the Mahdi Army, Hezbollah Brigades, and offshoots such as the Asaib Ahl al Haq. Hezbollah also aided in the formation of the Special Groups. Musa Ali Daqduq, a top Hezbollah operative who served as the chief of Nasrallah’s bodyguards as well as the head of the terror group’s special operations branch, was ordered to help establish Shia groups in Iraq along the lines of Lebanese Hezbollah, according to the US government. The US captured Daqduq in Basrah, Iraq in March 2007. Daqduq was released to Iraqi custody in December 2011 as the US withdrew from Iraq with the promise that he would be tried for his war crimes. But in 2012, he was freed by the Iraqi government and immediately traveled to Lebanon. After his release, US intelligence officials contacted by The Long War Journal said that Daqduq was involved with supporting Iraqi militias fighting in Syria. In its designation of Daqduq as a global terrorist in November 2012, the US Treasury Department said that sometime in 2005, “Iran asked Hezbollah to form a group to train Iraqis to fight Coalition Forces in Iraq.” The designation stated: “In response, Hassan Nasrallah established a covert Hezbollah unit to train and advise Iraqi militants in Jaish al Mahdi (JAM) [or Mahdi Army] and JAM Special Groups, now known as Asaib Ahl al Haq [the League of the Righteous],” a Mahdi Army faction. “As of 2006, Daqduq had been ordered by Hezbollah to work with IRGC-QF [Islamic Revolutionary Guards Corps-Qods Force] to provide training and equipment to JAM Special Groups to augment their ability to inflict damage against US troops,” Treasury noted. Thus, Musawai’s statements that Harakat al Nujaba and Hezbollah “are the twins of resistance that cannot ever be loosened or separated,” and “the blood of Hezbollah which flowed in the land of Iraq is our responsibility” are accurate. NOW HEZBOLLAH HAVE A TWIN ORGANIZATION CALLED “HARAKAT-AL- NUJABA”. THIS ORGANIZATION THE PROPAGANDA MACHINE. What it boils down to is are proxy groups fighting and being funded by Iran (SHIA) vs proxy groups being GCC (SUNNI). .The west says very little about proxy groups being funded by countries like Saudia Arabia where women cant even drive and cant go out without being covered up and in the presence of a male relative vs IRAN who also has proxy groups. No body talks about Saudia Arabia. 20 al quida terrorists hijacked 3 planes on 911 and killed thousands of people. 19 out of 20 terrorists were Saudi. Hello bin Laden??? Wahibism of Saudia Arabia are, drum roll please: Al quida, the Taliban, ISIS, AQUIM, al shabab, boko haram nusrah front….and the list goes on. The Saudi government has been funding wahibi teachings in madrassas and mosques in Pakistan and various countries around the world. But the west sats nothing simply because they want the oil.